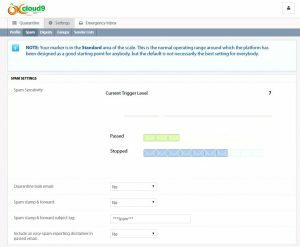 Silent Users also have personal, customizable settings – but these must be set and managed by an admin. They don’t have access to login and manage their own settings. All – Deliver all messages, but stamp spam email with the subject tag below. Partial – Delivery non-spam email normally. Quarantine very spammy email. Deliver moderately spammy email stamped with the subject tag below. This option allows you to report received messages as spam directly from the email message itself.